On the Streets of New Orleans depicts a rainy street scene of days gone by in New Orleans as cars, people with umbrellas, a horse and carriage, and trolley car leisurely go their way. On the Streets of New Orleans copyright© 1981 by G. Harvey is prohibited from being copied. 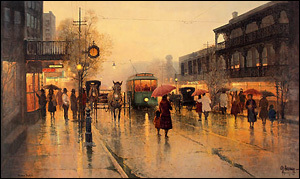 On the Streets of New Orleans by artist G. Harvey as well as other open and limited edition western paper art prints and canvases, giclees, images, lithographs, paintings, pictures, posters, and reproductions by renowned Somerset House Publishing and Texas Art Press artist G. Harvey can be viewed and purchased at special sale prices at Christ-Centered Art.